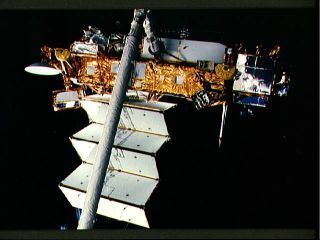 The Upper Atmosphere Research Satellite is in the grasp of the remote manipulator system end effector above the payload bay of the Earth-orbiting Discovery during STS-48 pre-deployment checkout procedures. A huge, dead satellite tumbling to Earth is falling slower than expected, and may now plummet down somewhere over the United States tonight or early Saturday, despite forecasts that it would miss North America entirely, NASA officials now say. The 6 1/2-ton Upper Atmosphere Research Satellite (UARS) was expected to fall to Earth sometime this afternoon (Sept. 23), but changes in the school bus-size satellite's motion may push it to early Saturday, according to NASA's latest observations of the spacecraft. NASA officials have said the the chances that a piece of UARS debris hits and injures one of the nearly 7 billion people on the planet are about 1 in 3,200. However, the personal odds of you being struck by UARS satellite debris are actually about 1 in several trillion, NASA officials have said. As of 10:30 a.m. EDT (1430 GMT) today, the UARS satellite was flying in an orbit of about 100 miles by 105 miles (160 kilometers by 170 km), and dropping. NASA launched the UARS satellite in 1991 to study Earth's ozone layer and upper atmosphere. The satellite was decommissioned in 2005. "Re-entry is expected late Friday, Sept. 23, or early Saturday, Sept. 24, Eastern Daylight Time," NASA officials wrote. "Solar activity is no longer the major factor in the satellite's rate of descent." The sun has had an extremely active week, one that has included several solar flares. High solar activity can cause the Earth's atmosphere to heat and expand, which can increase drag on a low-flying satellite like UARS, making it fall faster. Get a snapshot view of NASA's Upper Atmosphere Research Satellite (UARS), which will fall to Earth in 2011, in this SPACE.com infographic. Late Wednesday (Sept. 21), NASA predicted that the UARS satellite would not be over North America when it finally plunged down to the Earth's surface. That scenario has changed now that the 20-year-old satellite's descent has slowed, the agency said. But where the UARS spacecraft will fall still remains anyone's guess. NASA orbital debris experts have said the satellite could fall anywhere between the latitudes of Northern Canada and Southern South America, a region of Earth that encompasses much of the planet. "It is still too early to predict the time and location of re-entry with any certainty, but predictions will become more refined in the next 12 to 18 hours," NASA officials wrote in the latest update. NASA officials have said that, since 75 percent of the Earth is covered with water, it is likely that the UARS satellite could fall over an ocean. In fact, that possibility is one predicted by the California-based Aerospace Corporation's Center for Orbital and Re-Entry Debris Studies. The center's latest prediction places the UARS re-entry in the South Pacific west of South America around 8:58 p.m. EDT (0058 Sept. 24 GMT), give or take seven hours. Editor's note: If you snap a photo or observe the re-entry of NASA's UARS satellite and want to share it with SPACE.com for a story or gallery, contact managing editor Tariq Malik at: tmalik@space.com.